Although Kilbride was officially formed in 1948, the club’s beginnings go back to the early 1920′s. 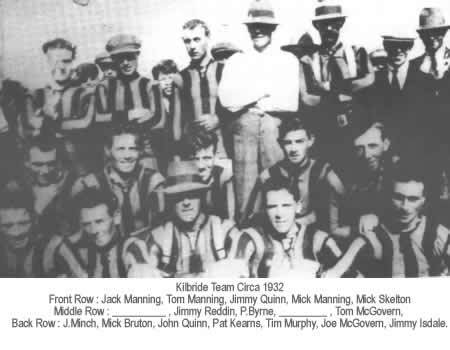 As far as can be ascertained a gaelic football team started in the parish in the early 1920′s. Around 1932 this team disbanded and some of it’s younger players transferred to the Flathouse team. This team was attired in vertical striped jerseys and wore hats or caps as was traditional at that time. From 1938 onwards a group of players travelled to Hollywood Rath to play matches against the Brothers and patients of St. John of God. It was in Frank Cannon’s yard in Ballymacarney in the year 1948 that the foundation of the current club was laid when Joe Murphy asked Larry Rooney and Paddy Marmiam if they would help him to get a team together. A team was entered in a league and since that time Kilbride has taken part in adult championship football in County Meath. Fund raising was organised and a set of black and blue hooped jerseys were purchased. The players of that time contributed weekly towards the purchase of boots and socks. 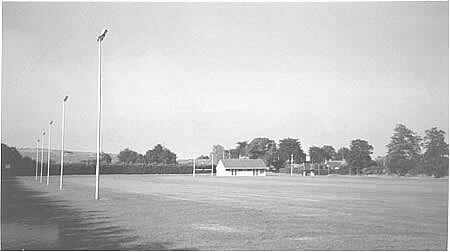 The first teams played and trained in a field owned by Conix Solicitors, on land owned by Liam Kavanagh, in Butlers of Priestown and during the early 1950′s on the land of the Brothers of St. John of God. 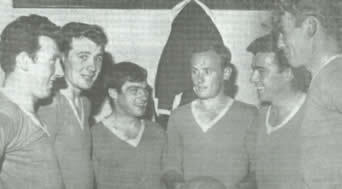 In the Mid 1950′s the club moved to Sweeney’s field and it became the club’s home base until the end of 1977. The club acquired it’s current playing field in 1983 and then in 1990 started building a club house with modern dressing room facilities, which was finished in 1993. On 13th May 1995, the club house and sports field were officially opened with the meeting of the Meath and Clare senior teams in a challenge. It is a great testament to the hard work of the members , good management by the commitee and the support of the community in general, that at the time of the official opening of the grounds everything was fully paid for. In 2002, work commenced on a floodlight system which will enable the team to train throughout the year. One side of the pitch is completely floodlit, with the other side due for completion in early 2004. Green and Red have been the recognised club colours since the mid 1950′s, although it is not known if there was a specific reason for the adoption of these colours. Other colours have also featured in the history of the club. The team of the 1920′s era wore a vertical striped jersey which was probably black and white. When the current era began, the team wore black and blue hooped jerseys, while the juvenile team wore green and white. 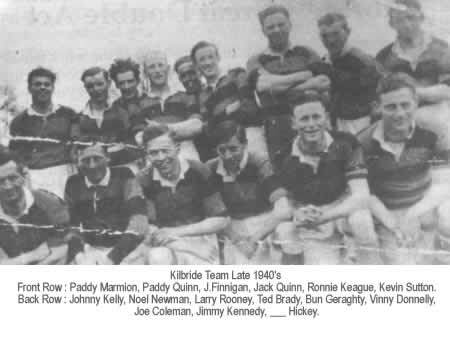 It is interesting to note that when Kilbride won it’s first Senior Championship in 1964 due to a clash of colours, Kilbride wore the Ratoath jersey’s of Blue and Gold. The Kilbride Camogie club was formed in 1964. The club won Meath Senior Titles in 1981, 1983, and 1984, Junior title in 1974 and 1992 an Under 16 and Under 18 Meath Championship. For a small club these were fantastic achievements and resulted in many players representing Meath. Back row L-R : A. Martin, T. McGovern, H. Kavanagh, A. Farrell, M. Lynch, M. Farrell, A. Barron, M. Rafferty, Front L-R : J. Sweeney, S. O’Sullivan, L. O’Sullivan, J. Donnelly, J. Walsh, M. Madigan, L. Mahon. Also during this period the club were runners up in the league on a number of occasions and travelled all over the country to play challenge games and tournaments. In 2001 Kilbride were promoted as winners of Division 5 to Division 4 and had a very good season just missing out on promotion to Division 3, despite numerous short term and long term injuries. Kilbride missed out by one point from qualification from the group stages to the quarter finals of the Junior championship. The only team to beat Kilbride in the Championship was Nobber, who have since gone on to become Meath, Leinster and All Ireland Junior Champions. There is a new optimisism within the club, that with an excellent new manager Martin McCarthy and a promising young team, that Kilbride can return to it’s rightful place at the top of Meath Football. With Kilbride players on board, Meath has won , Minor, Junior, under 21 and Senior Leinster titles, Minor, Junior and Senior All Ireland titles, a National league and representation in the Railway cup for Leinster. First Meath club to represent Meath in the Leinster Club championship. Through Martin Quinn, responsible for setting up Kepak sponsorship. Assisted as selector level through Martin and Gerry Quinn at Senior Level and through Tommy Mahon at Minor and under 21 level. Tommy Mahon also served on the Disciplinary Committee, Juvenile Committee, and the Meath Referees Associations Committee. Supplied Referees to County Board. Tommy Mahon has been chairman of the Meath Minor Board. Kilbride responsible for the design of the Official Meath Gaa website. Club members who have played for Meath at various levels include : Paddy Reilly, Martin Quinn, Gerry Quinn, Jack Quinn, Pat Bruton, Pat Rooney, Murty O’Sullivan, Wardie O’Sullivan, Sean Hickey, Owen Sullivan ( Cheeverstown ) , Owen Sullivan ( The Ward ), Ray Murtagh, Dermot White, Robert Rooney, Paddy Farrell, Richard Bruton, Garry O’Toole, Eugene McKeever, Kevin Quinn, Richard Rennicks, John Bruton and Andy Rennicks. .
Six from Kilbride : The six Kilbride men that were part of Meath’s 1967 All Ireland winning Success were left to right : P. Rooney, J. Quinn, P. Bruton, G. Quinn, M. Sullivan, M. Quinn.